The gold standard, under which any holder of paper dollars could redeem them for gold at the US Treasury, is now within the living memory of just a few million Americans, nearly all of whom would be dangerous behind the wheel. But thanks to the money printing and the federal deficits that have grown to astounding scales since 2008, and thanks also to the clashing pronouncements of Ron Paul and Ben Bernanke, the idea of a gold standard has resurfaced in the public's consciousness. I'm happy to see the concept enjoying a revival. Reading about it in the mainstream press and hearing it mentioned on the cable news shows makes me feel a little less like a Martian. It has almost made me feel avant-garde. Despite my enjoyment of the revival, I've noticed that the idea seldom is presented as a clear and definite proposal or as an invitation to revisit an institution that worked well in the past. Too often, it shows up as little more than a slogan or a taunt aimed at central bankers or as just a political fashion statement. So let's take a closer look at what it really means. It's not that complicated. The abolition of the gold standard has been the source of considerable mischief, but it hasn't been the source of all mischief. I've heard the lack of a gold standard indicted as part of a government scheme to force the public to use paper money. It isn't. The legal-tender laws are usually part of the story, but the story doesn't hold up. Declaring irredeemable paper dollars to be legal tender merely defines what a creditor may be forced to accept in satisfaction of a debt that is denominated in dollars. Operating under that regime is entirely voluntary; if you don't like it, you can avoid it by declining to accept anyone's IOU or other promise denominated in dollars. Despite the legal-tender laws that define what is a (paper) dollar, you are free to buy and sell and enter into contracts without using dollars. The legal-tender laws amount to no more than the government's claim that it owns "dollar" as a trademark that it can apply to pieces of paper or to anything else it decides to – just as General Motors owns the trademark "Chevy" and can apply it to any piece of machinery or any other product it chooses. GM and GM alone is free to serve up Chevyburgers, and you are free to eat one or not. Any two parties are free to use gold coins (or silver coins or strawberries) as a medium of exchange if they agree to. Pesos, francs and Canadian dollars are permissible as well. A return to the gold standard wouldn't alter that situation or expand the range of your choices. I've also heard the lack of a gold standard blamed for overall economic instability. Defenders of the current system of fiat money do just the opposite – they blame the gold standard of the past for preventing the Federal Reserve from stabilizing the economy. It's quite a debate – little economic logic and much cherry picking from the big tree of history. 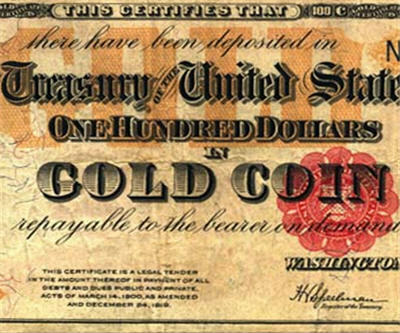 It all comes down to which system gets stuck with responsibility for the Great Depression of the 1930s, which occurred at a time when US citizens couldn't redeem dollars for gold (no confidence-building gold standard to help the economy recover) but foreign governments could redeem dollars for gold (that old gold standard, still causing so much trouble). A return to the gold standard wouldn't make you any freer than you are now. You'd still be filing tax returns and still be getting massage therapy from TSA employees; Congress wouldn't reform its big-spending ways, it would merely switch from taking and wasting fiat money to taking and wasting gold-backed money; and the Supreme Court, the guarantor of your liberties, would continue making things up as it goes along. A new gold standard wouldn't be an elixir of stability for the economy. A severe depression in 1919-1920 demonstrated the Federal Reserve's ability to engineer financial train wrecks even when the dollar is redeemable for gold by anyone and everyone. And before the advent of the Federal Reserve, the US Treasury demonstrated the same ability through its borrowing operations, as did Congress on a few occasions simply by creating uncertainty about possible changes in the monetary system. And a return to a gold standard wouldn't ensure long-term preservation of purchasing power for the dollar and dollar-denominated obligations – because, as we've seen, a gold standard adopted one day can be abandoned the next. Now that we've dampened expectations, here's what a gold standard would do: threaten the individuals who run monetary institutions (such as the Federal Reserve) with embarrassment for bad behavior. It narrows their opportunities for dodging responsibility. Every issuer of money promises to protect its value. The promise is the same whether it is made on behalf of a fiat currency or for a currency backed by gold, silver, copper, other currencies or seashells or pelts. A gold standard doesn't prevent an issuer from breaking the promise. It merely makes it difficult for the issuer to pretend that it is keeping the promise when year after year it isn't. With a fiat money system, you don't need any special talent in order to deceive the public with insincere talk about avoiding inflation and protecting the money's purchasing power. The years-long lag between printing and the effect on prices makes deception easy. If you print more money this year, well, it's only a temporary measure and only because of the recession you're trying to avoid. Next year, you'll slow down the printing or maybe not print at all – you'll have to wait and see what conditions are next year. And don't forget to mention the odd years of rapid monetary growth that coincided with almost no price inflation at all. And when price inflation does pick up, there's always someone or something to blame – OPEC or terrible growing conditions for the soybean crop in Brazil or a war. You'll think of something. Short of the complete destruction of a fiat currency, there is nothing that can demonstrate beyond doubt the shallowness of the promise to protect purchasing power that is being made on any day. There is no bright line separating performance from talk. With a gold standard, deception is much more difficult. Creating too much money will lead to redemptions that drain away the official gold stockpile. Everyone can see the inventory shrinking. If it shrinks to zero, then the managers of the system have failed, period. There is no ambiguity about it, and the politicians in charge at the time have little room for denial. The formal adoption of a gold standard holds no magic. It's just another promise. But it is a promise that carries an assured potential for egg-on-face political embarrassment if it is broken, and the only way for the people in charge to avoid that embarrassment is to refrain from recklessly expanding the supply of cash. That's why a gold standard protects the value of a currency, and that is why the politicians don't want it. Terry Coxon is one of several big-picture analysts at Casey Research who sift through today's cultural, political and economic trends looking for clues as to when and how they might shift… because those shifts hold strong profit potential for bold investors. To enjoy more articles like this, as well as to receive specific, actionable investment advice including when to buy or sell specific stocks and shorting stocks, among other things, sign up today for The Casey Report. A ninety-day trial is completely risk-free.